Fenton Street Market, which served as an outlet for artists and craftsmen, a stage for musicians and performers, a venue for civic engagement and a boost to the downtown Silver Spring economy, died today after a long struggle with bureaucracy. It was two years old. Started by local resident Hannah McCann, the market has been located at Veterans Plaza in downtown Silver Spring since last fall. This past July, Montgomery County's Office of Community & Public Facilities, which manages the plaza, decided to charge Fenton Street Market their standard fee. As a result, the market, which is entirely composed of local businesspeople, would go from paying $48 a week for the space to $1,200 a week. Ginny Gong, director of the Office of Community & Public Facilities, argued that the market was preventing other groups who'd pay the full fee from using Veterans Plaza, despite being in the space for just eight hours each week. "Concerns about fairness have been raised because the arrangement was outside the normal competitive process," she said. 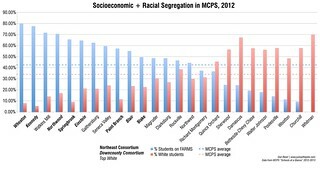 "Other organizations (both non-profit and for-profit) have not had the same level of access." Not surprisingly, local residents were upset. Nearly 800 people signed a petition in support of letting Fenton Street Market stay in the plaza at a reduced rate. "When a member of the community organizes an ongoing event that positively activates a public space and annually contributes $6.6 million to the local economy, she should be applauded and her efforts encouraged," wrote Evan Glass, president of the South Silver Spring Neighborhood Association. County Councilmember Hans Riemer, who lives in East Silver Spring, sought to find a workable solution. "We spent tens of millions, hundreds of millions on downtown Silver Spring, and now we're coming up short on a few thousand dollars? It's ridiculous," Riemer told JUTP in July. The county responded by releasing a Request for Proposals (RFP) for public markets in Veterans Plaza, the details of which are explained in a post on Fenton Street Market's website. Among the requirements are that the market provider must agree to move if another event wants to use the plaza; they must pay for trash pick-up and employees to staff the Civic Building, even though they wouldn't be allowed to use it; they must provide a portable toilet (despite the presence of bathrooms in the Civic Building); and they aren't allowed to have food vendors. In addition, the county must approve any signs or marketing materials used for the market, along with having full access to their financial records. For McCann, that was the last straw. The RFP's requirements are "at odds with a diverse, community-based market establishing a presence on the Plaza," she writes. "Fenton Street Market delivers a dependable, safe, and welcoming place to come together, and a homegrown authenticity that can’t be manufactured—or micromanaged." 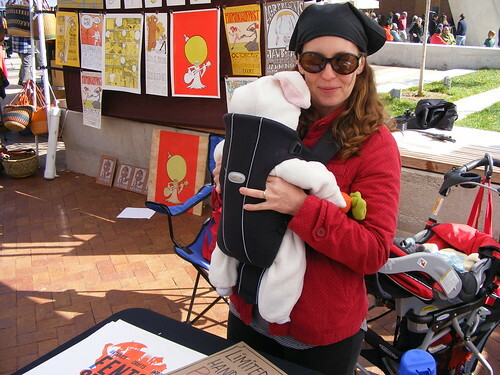 McCann and her then-newborn daughter at Fenton Street Market last fall. McCann, a writer for Architect magazine who lives in East Silver Spring, often walked past an empty parking lot at the corner of Fenton Street and Silver Spring Avenue and dreamed of opening a flea market there. 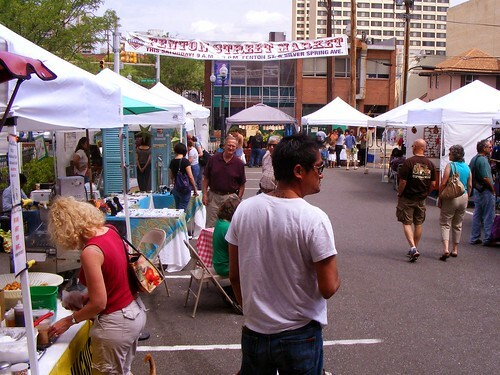 After working with the lot's owner, Ulysses Glee, to "borrow" it each Saturday morning, McCann held a test-run of the Fenton Street Market over two weekends in the fall of 2009. "There are so many people here who do art," she told me at the inaugural market. "It's bringing our community together to show what we do." The market was well received and returned the following April. When Glee began planning to build condos and a hotel on his lot, McCann approached Reemberto Rodriguez, director of the Silver Spring Regional Services Center, and Jennifer Nettles, then-property manager of the Downtown Silver Spring complex, about relocating Fenton Street Market to the newly-opened Veterans Plaza. Recognizing the market's ability to draw customers to the area, the county struck a deal with McCann to rent her the plaza during at a steeply reduced rate. Throughout its brief life, the market has been a boon to the local economy. An Economic Market Study conducted by the market's volunteer staff found that over 2,500 people visited Fenton Street Market each week and that its presence brought $1.9 million in added revenues to area businesses each year. Fenton Street Market will be laid to rest on November 12, but a viewing of the 49-page Request for Proposals will be held at the market this Saturday between 9am and 3pm in Veterans Plaza, located at the corner of Fenton Street and Ellsworth Drive in downtown Silver Spring. It is survived by a weekly farmers' market and whatever else they have planned in the area. Condolences can be sent to hannah at fentonstreetmarket dot com OR ginny dot gong at montgomerycountymd dot gov, who didn't know how to leave a good thing alone. Feels like a kick in the stomach. Ginny Gong may as well be a robot. No emotion or ability to think outside of the rules and regs. I've approached her with issues in the past with respect to how they let childcare providers in the schools and the lack of control and she has no ability or interest to think through an issue to try to negotiate a good plan. I've sat through her board meetings. It's either X or Y with her, and that's a shame. That being said, I'd love to use the space for a weekly carnival for local families and would pay the requested rate. I do actually think there are two sides to the issue. $48 a day is way too low, if in fact other people are looking to pay what MoCo has established as market rate. Also, in general, I don't think it's fair for FSM to have plaza to itself for all the prime Saturdays of the year. That said, FSM will be missed and hopefully some different iteration of it pops up, either on the plaza or somewhere else. Montgomery County leased Ellsworth Drive to Peterson Companies for a dollar in exchange for managing it. Somehow, letting FSM use half of Veterans Plaza for $48 a week is unfair? I'm worried that the RFP is so strict that nothing will be able to fill the space . . . except, perhaps, for some well-funded Peterson event. Not that they don't have some good programming, but they've got plenty of space for their own stuff. God damnit. WTF is wrong with our county? The FSM and the Farmer's Market were two of the biggest bright spots in the entire county. They helped market this area. If they can't see how valuable that is, they need to get out of government. Who can I call to complain about/punch for this ridiculous decision? This is embarassing. 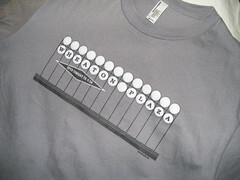 Silver Spring would be better off it were an incorproated city and not under the thumb of incompetent suburbanites. Comparing the Ellsworth $1 to the FSM $48 is completely unfair. If FSM built, patrolled, and cleaned the plaza and civic center like Peterson Co. did/does to its property, then it'd be a logical comparison. I can't believe you have me defending MoCo and Peterson Co. now, Dan! I'm just saying that if there are groups out there willing to pay market rate for the prime hours of the prime Saturdays, it makes sense that FSM shouldn't always get the space, much less always get the space for basically free. There was/is a middle ground here - something along the lines of FSM getting it for a reduced rate on weeks that other organizations interested in paying more don't book it. The RFD seems to be looking for something along those lines as well. I'm with Barry on this one. There is plenty of space in South Silver Spring to host this. Okay, I'll use another example. When the Civic Building opened last summer, Round House Theatre was allowed to take over the entire basement for free, even though they also have space (for free or a discounted rent, not sure) on the first floor of the Wayne Avenue parking garage. There are plenty of non-profits in Silver Spring who'd love to have some of that space, but none of them get to use it because MoCo made a promise to Round House several years ago and they chose to honor it. Is it fair? Maybe not. But that's what the county did to FSM. They made an arrangement with them, albeit a "temporary" one, then tossed it aside. But unlike Round House, FSM uses the plaza only a portion of the time, and there aren't a bunch of other users clamoring for the space at that time (that we know of). The burden was on the county to prove that this space is contested, and they failed to do so.